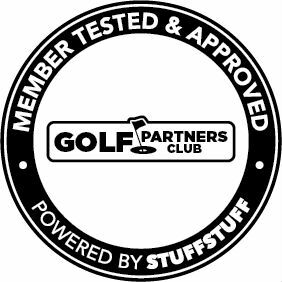 We are excited to announce that 100 members of the GOLF Partners Club tested and approved GOLFSTR+. The Golf Partners Club is one of seven affiliate organizations with over 400,000 members participating in programs offered by the North American Media Group (NAMG Inc.). 77% of the participants testing GOLFSTR+ recommended it as a golf training aid that will lower your score. 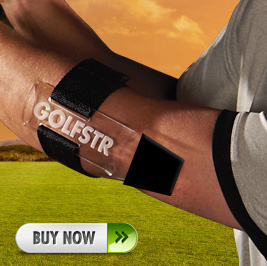 100 Golfers tested and evaluated GOLFSTR+ to qualify this product for Certifications. This product is not perfect for everyone but the overwhelming test results qualified GOLFSTR+ for the Golf Partners Club: Seal of Approval. Comment about your experience with it. -Thought that the product was revolutionary. Overall experience was phenomenal. -I have been trying to address my “chicken wing” swing for some time now. This is the best product that I have found on the market! -Thought it was a good looking teaching aid. Everyone wanted to use it. -The product does what it’s meant to do. On average I gained an extra 40-70 yards on my drives. Can’t argue with the results. The trainer does work and it works pretty good. -I shared this product with many family members and they all got one of their own. -Honestly, my golfing buddies were not happy with this product. It took 5 strokes off of my usual game, and made it more competitive for them. -I think it is perfectly designed for what it is designed to do. I highly recommend this product for making my game better and more enjoyable. -Dramatically improved the scores for my son and his friends. Truly a great product. Improved my golf game tremendously. -My friends laughed at me when I put it on at the driving range, but once I began hitting with better accuracy and all but eliminated my slice, they were asking for a go at it. After about an hour, everyone was laughing, but that was because our swings were improving. 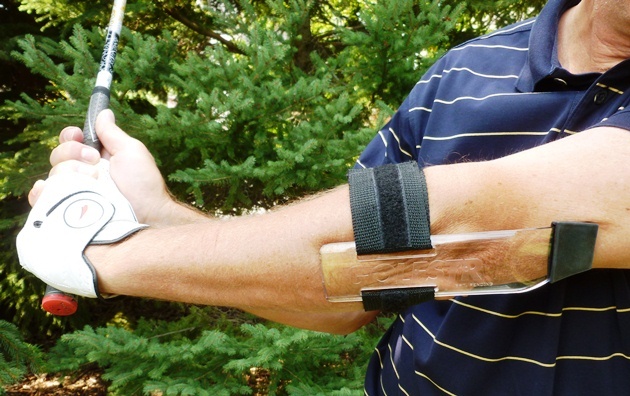 -Over all I liked this training aid, and the results were better than expected (took two strokes off my game in a week) I will continue to use this aid. -Little uncomfortable at first, but it is to be expected since it takes you out of your comfort zone. -During my first bucket of balls, I was hitting straighter than I have ever hit. Within a few buckets of balls after using the product, I removed the Straight Arm Trainer and was hitting much straighter, adding 20+ yards to my drive. I can’t wait to get back out on the course! -My family liked it, and after letting them try it, they want to buy it! -I would recommend this product because it helps correct bad habits. I grew up playing baseball so it is hard for me not to bend my elbow while swinging a golf club. 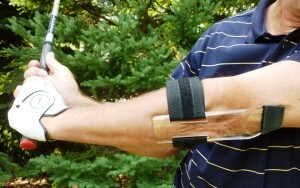 Wearing the GOLFSTR helps remind me to keep my arm straight. Has certainly helped me be more consistent with my golf swing. -I really like the versatility of use in this product. -My neighbor and I share a massive empty lot across from our houses and frequently hit balls into the field. He was impressed enough to borrow it to help with his daughters swing. -I found a lot of improvement in my short game swings. I was able to strike the ball much more accurately with the putter and had more direction control with my irons. -I was skeptical about this product. There are so many golf aids that promise a better straighter further shot. However I found with this product that even though it didn’t keep your arm straight for you it definitely made you aware when you weren’t keeping your arm straight. I tried this on two rounds of golf. The second round I didn’t use the product but I found with every shot I was more aware of my arm being straight then I had ever been before. In my case I lost only one ball for an entire round, and even though I am still not ready for the pro tour, more than 90% of my shots were straight. A huge improvement for me. I was very pleased. The comments are overwhelming. I could enter about 300 more but I think you get the idea. The results of this research have inspired us to re-launch GOLFSTR+ with an exciting new image showing a golfer in 6 swing positions with 6 different clubs and wearing GOLFSTR+ for each of the 6 USES. This image may look like an Octopus golfing and should create attention for this unique Golf Training Aid. Hoping it will go viral. CLICK www.golfstr.com to order on the STORE Page or call 1-855-799-9695 any time of the day 24/7.